Dermatofibroma, Histiocytofibroma, Df, Dermoscopy, Dermatoscopy Dermatofibromas – cite! Dermatofibromas (message) Dermatofibromas – participate! Dermatofibromas (DFs) are prevalent cutaneous lesions that most frequently affect young to middle-aged adults, with a slight predominance in females. Clinically, dermatofibromas appear as firm, single or multiple papules/nodules with a relatively smooth surface and predilection for the lower extremities. Characteristically, upon lateral compression of the skin surrounding dermatofibromas, the tumors tend to pucker inward producing a dimple-like depression in the overlying skinThis glossary term has not yet been described. ; a feature known as the dimple or Fitzpatrick’s sign. Delicate pigment networkGrid-like pattern consisting of interconnecting pigmented lines surrounding hypopigmented holes. : light-to-medium pigment network, brown in colorColor (American English) or colour (Commonwealth English) is the characteristic of human visual perception described through color categories, with names such as red, yellow, purple, or blue., with a fine and delicate quality, which gradually fades into the surrounding skin and is usually located at the periphery of the lesion. 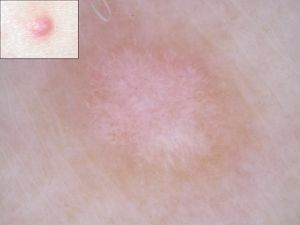 A central scar-like white patch: an irregularly outlined and sharply demarcated white area in the center of the lesion. In nonpolarized light dermoscopy appears as a white scar-like area and in polarized lightThis glossary term has not yet been described. dermoscopy as bright white areas with or without bright white linear streakslines radial (always at periphery) streaks Reed nevus melanoma recurrent nevus (Shiny white linesstreaksThis glossary term has not yet been described.). Ring-like or donut-shaped globulesThis glossary term has not yet been described. : The pigment networkThis glossary term has not yet been described. located toward the center of the lesion often ceases to look like a reticulated mesh but rather begins to resemble “ring-like” globular structuresThis glossary term has not yet been described. White network : white lines surrounding small islands of brown pigment or surrounding globuleThis glossary term has not yet been described.-like (i.e., “ring-like”) structures. Homogenous areas with brown color. Vascular structuresThis glossary term has not yet been described. : The most common vascular structuresThis glossary term has not yet been described. are erythema, dotted vesselstiny pinpoint vessels, comma vesselslinear curved short vessels dermal nevi, and hairpin vesselsThis glossary term has not yet been described.. Less frequently, glomerular vesselsThis glossary term has not yet been described., linear–irregular vessels, linear vesselsLinear mildly curved vessels considered irregular when different sizes shapes and curves with a haphazard or random distribution are presented and considered regular when short and fine (thin) linear vessels prevail various diagnoses in a radial arrangementThis glossary term has not yet been described., and polymorphous/atypical vessels are visible. Rarely comedo-like openings[[Comedo like openings]], scale, ulceration, peripheral collarette fissures, ridges and mamillatted surface. The different dermoscopic features of dermatofibromaDermatofibromas are hard solitary slow-growing papules (rounded bumps) that may appear in a variety of colours, usually brownish to tan; they are often elevated or pedunculated. A dermatofibroma is associated with the dimple sign; by applying lateral pressure, there is a central depression of the dermatofibroma. are combined into ten different typical dermoscopic patterns and one atypical pattern. Peripheral delicate pigment network and central white scar-like patch - This "stereotypical" dermoscopic pattern is seen in most cases of dermatofibroma and has been reported in 18-35% of DFs. Delicate pigment network throughout - 3-15% of DFs. Peripheral delicate pigment network and central white network - 5-9% of DFs. Peripheral delicate pigment network and central homogenous pigmentation - 4-5% of DFs. White network throughout - 2% of DFs. Homogenous pigmentation throughout - 5-11% of DFs. White scar-like patch throught- 4-6% of DFs. Multiple focal white scar-like patches - 6-8% of DFs. Peripheral homogenous pigmentation and central white scar-like patch - 7-8% of DFs. Peripheral homogenous pigmentation and central white network - 5-8% of DFs. Dermatofibromas showing atypical pigment networkNetwork with increased variability in the color, thickness, and spacing of the lines of the network; asymmetrically distributed; gray color, atypical scar-like patch, atypical homogeneous pigmentation or their irregular distribution within the lesion. The atypical pattern can be further subdevided into: (1) 'MelanomaThis glossary term has not yet been described.-like'; (2) 'vascular tumor-lie'; (3) 'basal cell carcinomais the most common skin cancer, and one of the most common cancers in the United States. While BCC has a very low metastatic risk, this tumor can cause significant disfigurement by invading surrounding tissues-like'; (4) 'collision tumor-like'; (5) 'psoriasisThis glossary term has not yet been described.-like'. Hemosiderotic or aneurysmal dermatofibroma usually manifests with a multi-component or atypical dermoscopic pattern with central bluish/reddish homogenous areas in combinationThis glossary term has not yet been described. with white structures, peripheral delicate pigment network, and vascular structures. Sometimes, blue homogeneous pigmentation throughout is observed. Lipidized dermatofibroma usually manifests with the presence of single/multiple foci of yellow coloration/pigment. ↑ Zaballos et al. : Dermoscopy of dermatofibromas: a prospective morphological study of 412 cases. Arch Dermatol 2008;144:75-83. PMID: 18209171. DOI. ↑ Ferrari et al. : Typical and atypical dermoscopic presentations of dermatofibroma. J Eur Acad Dermatol Venereol 2013;27:1375-80. PMID: 23176079. DOI. This page was last modified on 28 December 2018, at 20:42.